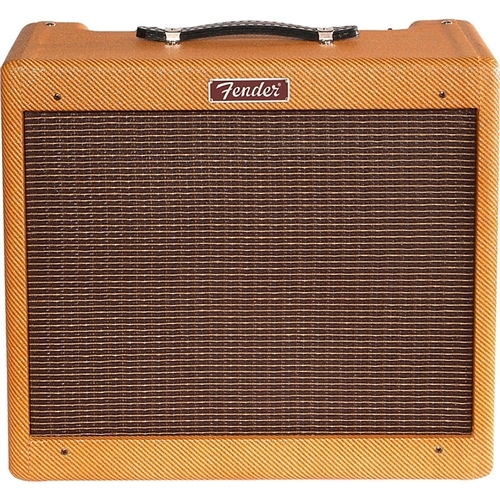 The Blues Jr. Lacquered Tweed takes Fender's 15 watt gem and gives it the true vintage treatment with a lacquered tweed covering and a vintage-voiced 12" Jensen speaker. 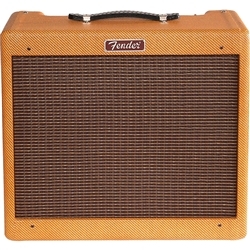 Its golden tones are generated by an all-tube signal path using a pair of EL84 output tubes and 3 - 12AX7 preamp tubes. Add renowned Fender reverb, flexible controls, FAT switch for mid boost, and you're in business. And just look at that chrome panel, that tweed finish with vintage-style brown and gold grille cloth, and those vintage pointer knobs!